Fantastic Home! Outdoor Decks and Huge Yard! Steps to Free Shuttle. 4 bedroom, 3.5 bath, sleeps 10. With fantastic views of Mt. Crested Butte and just steps from the free shuttle stop, Saddlehorn Retreat is your next vacation destination. With 4 spacious bedrooms, 3.5 baths, 2 living areas, and a fantastic great room, this home couldn't be more comfortable. Located within view of the ski resort on a quiet street in Mt. Crested Butte sits this wonderful home with almost 3,000 square feet of living space and a detached, heated garage. 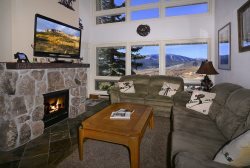 Take a short walk to the corner of the street and catch the free shuttle to the base for a day of skiing or down to town for dinner Throw in an oversized yard for the kids and 3 outdoor decks, you will have a hard time leaving. Entering this home brings you into the largest mud room we've ever seen. With a brick paver floor and seating for putting on your boots, be they ski, hiking, or your favorite pair of cowboy boots. It's a great place to store all of your gear whatever the season. Open the french doors into the great room where the living, kitchen, and dining are all combined so the whole family is a part of the action. This home lives all on one level other than 2 bedrooms and a bathroom upstairs making it perfect for the family that doesn't like stairs. The living room has plenty of seating and boasts a river rock wall with wood burning fireplace and flat panel TV. The granite and stainless kitchen is fully stocked and open to the great room so nobody misses out on a great story. The dining room table expands to seat 10 and is surrounded by windows offering a great view of Mt. Crested Butte. There are two decks outside with a gas grill and outdoor dining. They also offer a great place to sit and enjoy a beverage as the kids play in the yard. Down the hall is the master bedroom with queen bed and en-suite bath. There is a cozy reading chair in the master for that perfect book and morning cup of coffee. Further down the hall is a 1/2 bath and guest bedroom with queen bedroom and en-suite bath with oversized shower. Situated at the back of the house is the second living room with comfy leather sofa, television, a desk area should you need to use the WiFi to check in with work, and a great gas fireplace. There is another large deck off this room overlooking the back yard. Upstairs you will find two additional guest bedrooms connected by a jack and jill bath that has a shower/tub combo. One bedroom has a queen bed and the other has two sets of bunks to store all the kids. Outside you will find a heated garage and plenty of parking. With room for ten, and tons of natural light, you might just have found your family's "go to" vacation home! Amazing house! We stayed here with another family and had such a great time! The location to the ski hill is so convenient. The house is stocked well with a ton of dishes and cooking utensils/pots/pans. We cooked in all 3 nights an had everything we needed! Also plenty of towels, shampoo and toiletry items. This house made us feel very at home. Would highly recommend! The staff is extremely helpful, friendly, kind, and caring. The house was very clean and nicely decorated. The beds were very comfortable. The sheets and towels were very comfortable. The showerhead in the back bedroom/bathroom was amazing! I loved those showers! What a great experience. The house worked very well for our group and the Ironhorse folks were some of the best when it came to customer service. The home was light, bright and well laid out for our family. Very comfortable and had everything we needed. With two living areas, a large dining room, 3 decks, and a beautiful lawn our family reunion was wonderfully accommodated. I'll come again if I can. Great location , close to the slopes . Maintain roads daily and House was in great condition. Again, Katie was wonderful and quick and super helpful to work with. Thanks! What a great experience. The house worked very well for our group and the Ironhorse folks were some of the best when it came to customer service. Thanks again Ironhorse, CB!! !